2005-12-05 Assigned to 3M INNOVATIVE PROPERTIES COMPANY reassignment 3M INNOVATIVE PROPERTIES COMPANY ASSIGNMENT OF ASSIGNORS INTEREST (SEE DOCUMENT FOR DETAILS). Assignors: BIERNATH, ROLF W., OUDERKIRK, ANDREW J., BENSON, JR., OLESTER, BROTT, ROBERT L., KOWITZ, DAVID A., MERRILL, WILLIAM WARD, TARNOWSKI, CATHERINE P.
An article, such as a film, comprising a body portion and a surface portion is provided. The body portion has (i) a first and a second surface, and (ii) first and second in-plane axes that are orthogonal with respect to each other and a third axis that is mutually orthogonal to the first and second in-plane axis in a thickness direction of the body. The surface portion comprises a linear geometric feature disposed on the first surface of the body in a direction substantially parallel to the first in-plane axis of the polymeric body. The article has (i) a first index of refraction (n1) along the first in-plane axis, (ii) a second index of refraction (n2) along the second in-plane axis, and (iii) a third index of refraction (n3) along the third axis, wherein n2 and n3 are substantially the same but substantially different from n1; and wherein the uniaxially oriented polymeric film has a relative birefringence of 0.3 or less and wherein the ratio of the thickness of the body to the height of the geometric feature is at least 2. (b) a linear geometric feature disposed on the first surface of the polymeric body in a direction substantially parallel to the first in-plane axis of the polymeric film; wherein the film has a shape retention parameter (SRP) of at least 0.1.
wherein the (a) ratio of the thickness of the body (Z′) to the height of the geometric feature (P′) is at least about 2; or (b) the ratio of body thickness to feature height (Z′:P′) is at least about 1 and the ratio of feature height to a feature separation (P′:FS′) is at least about 1; or (c) the ratio of body thickness to feature height (Z′:P′) is at least about 1 and the ratio of feature base width to a feature separation (BW′: FS′) is at least about 1; or (d) the ratio of body thickness to feature base width (Z′:BW′) is at least about 3; or (e) the ratio of body thickness to feature base width (Z′:BW′) is at least about 1 and the ratio of feature height to a feature separation (P′:FS′) is at least about 1; or (f) the ratio of body thickness to feature base width (Z′:BW′) is at least about 1 and the ratio of feature base width to a feature separation (BW′:FS′) is at least about 1; or (g) the ratio of feature base width to feature top width (BW′:TW′) is at least about 2 and the ratio of feature base width to a feature separation (BW′:FS′) is at least about 1.
wherein the oriented polymeric film has (i) a first index of refraction (n1) along the first in-plane axis, (ii) a second index of refraction (n2) along the second in-plane axis, and (iii) a third index of refraction (n3) along the third axis, wherein n1≠n2 and n1≠n3 and n2 and n3 are substantially equal to one another relative to their differences with n1. In one aspect of this embodiment of the invention the ratio of the thickness of the polymeric body to the height of the geometric feature is at least about 2. In yet another aspect of the invention, the article has a first refractive index (n1) along the first in-plane axis, a second refractive index (n2) along the second in-plane axis and a third refractive index (n3) along the third in-plane axis. In the present invention, n1 ≠ to each of n2 and n3. That is, n1 may be greater than n2 and n3 or it may be less than n2 and n3. Preferably n2 and n3 are substantially equal to one another. The relative birefringence of the film of the invention is preferably 0.3 or less. With specific reference to FIG. 2, the film of the invention 10 comprises a body or land portion 12 having a thickness (Z′) and a surface portion 14 having a height (P′). Surface portion 14 comprises a series of parallel geometric features 16 comprising prisms. Geometric features 16 each have a base width (BW′) and a peak-to-peak spacing (PS′). The film of the invention has a total thickness T′ which is equal to P′ +Z′. An image is then acquired of a cross-section of the film after stretching. The sectioning plane is the plane defined by the second in-plane axis and the third axis. If the film has been stretched by a non-continuous, or “batch” process, such as on a laboratory film stretching instrument, it will be possible to select the same feature as that selected when examining the film specimen before stretching. If the film has been stretched on a continuous film-making line, the feature should be selected from an appropriate location on the stretched film web, analogous to the location that was chosen on the unstretched web, as will be appreciated by one skilled in the film making art. A Feature Baseline (FB) is again established, and the area of the stretched film feature is then calculated. This is the Stretched Feature Area (SFA). For any particular film, CAR will differ from unity by an amount that depends at least on the shape of the feature, the stretch ratio, and the degree to which the stretching operation approaches a truly uniaxially orienting stretch. Other factors may also be involved. In order to quantify the degree of deviation from perfect shape retention, it is necessary to develop another parameter, the Shape Retention Parameter (SRP). The SRP is a measure which indicates proportionately where a film having a structured surface falls, on a continuum, from perfect shape retention at one extreme, to a selected reference point characteristic of typical industrial practice, at the other extreme. We have chosen as such a reference point the performance, for the same feature shape and stretch ratio, of an idealized film tenter (transverse orienter) operated efficiently in a continuous mode. The major axis of the features on the film's structured surface is assumed to be parallel to the crossweb direction, which is the stretch direction. Edge effects and all other process non-idealities are neglected, as are non-idealities of the film material itself, such as changes in density upon stretching, for example. For this ideal tenter case, then, all the transverse stretch imparted to the film is accommodated by shrinkage of the film, by the same ratio, and in the thickness dimension only. Because the hypothetical tenter is ideal, there is no shrinkage of the film in the machine or downweb direction. The image of FIG. 4A is computationally converted to the image of FIG. 4B by shrinking only the height dimension by a factor of the stretch ratio used in making the film in question. This simulates what would have happened to the film surface feature in the “ideal tenter” for the feature shape and stretch ratio in question. The image is then converted from that of FIG. 4B to that of FIG. 4C by scaling it up in each of the height and width dimensions by a factor of the square root of the stretch ratio. Thus, the image of FIG. 4C has an area identical to that of the image of FIG. 4A. The images of FIG. 4A and FIG. 4C are then superimposed and translated along their common baseline until the position of maximum overlap area is found. This is shown in FIG. 4D. The common area of this figure (the crosshatched area which is common to both the original feature image and the computationally processed feature image) is calculated, and the ratio of this area to the area of the image of FIG. 4A is calculated. This value is the Common Area Ratio for the Ideal Tenter (CARIT), for the given feature shape and stretch ratio. It will be understood that this calculation must be done independently for each film specimen, as the CARIT is a strong function of both the unstretched feature shape and the stretch ratio employed. In one embodiment of the present invention, a film having a structured surface has a value of SRP of about 0.1 to 1.00. In another embodiment of the present invention, a film having a structured surface has a value of SRP of about 0.5 to 1.00. In another embodiment of the present invention, a film having a structured surface has a value of SRP of about 0.7 to 1.00. In another embodiment of the present invention, a film having a structured surface has a value of SRP of about 0.9 to 1.00. FIGS. 5A-5W illustrate other cross-section shapes that may be used to provide the structured surface. These Figures further illustrate that the geometric feature may comprise a depression (See FIGS. 5A-I and 5T) or a projection (see FIGS. 5J-5S and 5U-5W). In the case of features that comprise depressions, the elevated area between depressions may be considered to be a projection-type feature as shown in FIG. 3C. The microstructure geometric features illustrated in FIG. 2 either comprise or approximate a right angle prism. As used herein, a right prism has an apex angle of from about 70° to about 120°, preferably from about 80° to 100° , most preferably about 90°. Additionally the faces of the microstructure feature are flat or approximate a flat surface. wherein Rf is CnF2n+1—(CH2)m—, wherein n is an integer from 1 to 22 and m is 0, or an integer from 1 to 6; X is —CO2—, —SO3—, —CONH—, —O—, —S—, a covalent bond, —SO2NR—, or —NR—, wherein R is H or C1 to C5 alkylene; Y is —CH2—wherein z is 0 or 1; and R′ is H, lower alkyl or Rf—X—Yz—with the provisos that when X is —S—, or —O—, m is 0, and z is 0, n is ≧7 and when X is a covalent bond, m or z is at least 1. Preferably n+m is equal to an integer from 8 to 20. In the case of truly uniaxial stretching with a stretch ratio of X along the first in-plane direction, when the process creates substantially the same proportional dimensional changes in the second in-plane axis and in the thickness direction of the film along the third axis, the thickness and the width will have been reduced by the same proportional dimensional changes. In the present case, this may be approximately represented by KT/λ0.5 and KW/λ0.5 where K represents a scale factor that accounts for density changes during stretch. In the ideal case, K is 1. When the density decreases during stretching, K is greater than 1. When density increases during stretching, K is less than 1. In general, polymers used in the present invention may be crystalline, semi-crystalline, liquid crystalline or amorphous polymers or copolymers. It should be understood that in the polymer art it is generally recognized that polymers are typically not entirely crystalline, and therefore in the context of the present invention, crystalline or semi-crystalline polymers refer to those polymers that are not amorphous and includes any of those materials commonly referred to as crystalline, partially crystalline, semi-crystalline, etc. Liquid crystalline polymers, sometimes also referred to as rigid-rod polymers, are understood in the art to possess some form of long-range ordering which differs from three-dimensional crystalline order. The present invention contemplates that any polymer either melt-processable or curable into film form may be used. These may include, but are not limited to, homopolymers, copolymers, and oligomers that can be further processed into polymers from the following families: polyesters (e.g., polyalkylene terephthalates (e.g., polyethylene terephthalate, polybutylene terephthalate, and poly-1,4-cyclohexanedimethylene terephthalate), polyethylene bibenzoate, polyalkylene naphthalates (e.g. polyethylene naphthalate (PEN) and isomers thereof (e.g., 2,6-, 1,4-, 1,5-, 2,7-, and 2,3-PEN)) and polybutylene naphthalate (PBN) and isomers thereof), and liquid crystalline polyesters); polyarylates; polycarbonates (e.g., the polycarbonate of bisphenol A); polyamides (e.g. polyamide 6, polyamide 11, polyamide 12, polyamide 46, polyamide 66, polyamide 69, polyamide 610, and polyamide 612, aromatic polyamides and polyphthalamides); polyether-amides; polyamide-imides; polyimides (e.g., thermoplastic polyimides and polyacrylic imides); polyetherimides; polyolefins or polyalkylene polymers (e.g., polyethylenes, polypropylenes, polybutylenes, polyisobutylene, and poly(4-methyl)pentene); ionomers such as Surlyn™ (available from E. I. du Pont de Nemours & Co., Wilmington, Del. ); polyvinylacetate; polyvinyl alcohol and ethylene-vinyl alcohol copolymers; polymethacrylates (e.g., polyisobutyl methacrylate, polypropylmethacrylate, polyethylmethacrylate, and polymethylmethacrylate); polyacrylates (e.g., polymethyl acrylate, polyethyl acrylate, and polybutyl acrylate); polyacrylonitrile; fluoropolymers (e.g., perfluoroalkoxy resins, polytetrafluoroethylene, polytrifluoroethylene, fluorinated ethylene-propylene copolymers, polyvinylidene fluoride, polyvinyl fluoride, polychlorotrifluoroethylene, polyethylene-co-trifluoroethylene, poly (ethylene-alt-chlorotrifluoroethylene), and THV™ (3M Co.)); chlorinated polymers (e.g., polyvinylidene chloride and polyvinylchloride); polyarylether ketones (e.g., polyetheretherketone (“PEEK”)); aliphatic polyketones (e.g., the copolymers and terpolymers of ethylene and/or propylene with carbon dioxide); polystyrenes of any tacticity (e.g., atactic polystyrene, isotactic polystyrene and syndiotactic polystyrene) and ring- or chain-substituted polystyrenes of any tacticity (e.g., syndiotactic poly-alpha-methyl styrene, and syndiotactic polydichlorostyrene); copolymers and blends of any of these styrenics (e.g., styrene-butadiene copolymers, styrene-acrylonitrile copolymers, and acrylonitrile-butadiene-styrene terpolymers); vinyl naphthalenes; polyethers (e.g., polyphenylene oxide, poly(dimethylphenylene oxide), polyethylene oxide and polyoxymethylene); cellulosics (e.g., ethyl cellulose, cellulose acetate, cellulose propionate, cellulose acetate butyrate, and cellulose nitrate); sulfur- containing polymers (e.g., polyphenylene sulfide, polysulfones, polyarylsulfones, and polyethersulfones); silicone resins; epoxy resins; elastomers (e.g., polybutadiene, polyisoprene, and neoprene), and polyurethanes. Blends or alloys of two or more polymers or copolymers may also be used. 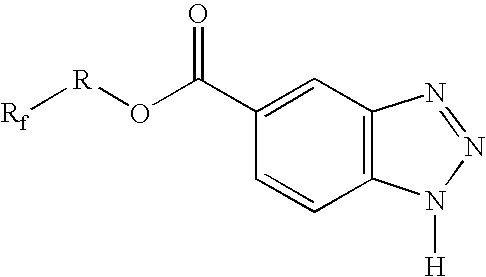 Suitable diol comonomers include but are not limited to linear or branched alkane diols or glycols (such as ethylene glycol, propanediols such as trimethylene glycol, butanediols such as tetramethylene glycol, pentanediols such as neopentyl glycol, hexanediols, 2,2,4-trimethyl-1,3-pentanediol and higher diols), ether glycols (such as diethylene glycol, triethylene glycol, and polyethylene glycol), chain-ester diols such as 3-hydroxy-2,2-dimethylpropyl-3-hydroxy-2,2-dimethylpropyl-3-hydroxy-2,2-di methyl propanoate, cycloalkane glycols such as 1,4-cyclohexanedimethanol and its isomers and 1,4-cyclohexanediol and its isomers, bi- or multicyclic diols (such as the various isomeric tricyclodecane dimethanols, norbornane dimethanols, norbornene dimethanols, and bicyclo-octane dimethanols), aromatic glycols (such as 1,4-benzenedimethanol and its isomers, 1,4-benzenediol and its isomers, bisphenols such as bisphenol A, 2,2′-dihydroxy biphenyl and its isomers, 4,4′-dihydroxymethyl biphenyl and its isomers, and 1,3-bis(2-hydroxyethoxy)benzene and its isomers), and lower alkyl ethers or diethers of these diols, such as dimethyl or diethyl diols. 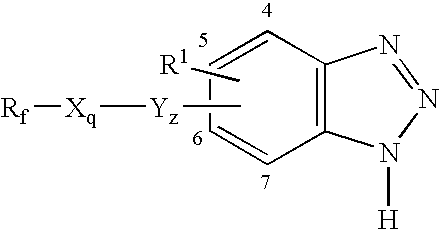 Other aliphatic, aromatic, cycloalkyl and cycloalkenyl diols may be used. Suitable polyester copolymers include copolymers of PEN (e.g., copolymers of 2,6-, 1,4-, 1,5-, 2,7-, and/or 2,3-naphthalene dicarboxylic acid, or esters thereof, with (a) terephthalic acid, or esters thereof; (b) isophthalic acid, or esters thereof; (c) phthalic acid, or esters thereof; (d) alkane glycols; (e) cycloalkane glycols (e.g., cyclohexane dimethanol diol); (f) alkane dicarboxylic acids; and/or (g) cycloalkane dicarboxylic acids (e.g., cyclohexane dicarboxylic acid)), and copolymers of polyalkylene terephthalates (copolymers of terephthalic acid, or esters thereof, with (a) naphthalene dicarboxylic acid, or esters thereof; (b) isophthalic acid, or esters thereof, (c) phthalic acid, or esters thereof, (d) alkane glycols; (e) cycloalkane glycols (e.g., cyclohexane dimethane diol); (f) alkane dicarboxylic acids; and/or (g) cycloalkane dicarboxylic acids (e.g., cyclohexane dicarboxylic acid)). The copolyesters described may also be a blend of pellets where at least one component is a polymer based on one polyester and other component or components are other polyesters or polycarbonates, either homopolymers or copolymers. The film of the invention may also contain a disperse phase comprising polymeric particles in a continuous polymeric matrix or a bi-continuous matrix of phases. In an alternative, embodiment of the invention, the disperse phase may be present in one or more of the layers of a multilayer film. The level of polymeric particles used is not critical to the present invention and is selected so as to achieve the purposes for which the final article is intended. Factors which may affect the level and type of the polymer particles include the aspect ratio of the particles, the dimensional alignment of the particles in the matrix, the volume fraction of the particles, the thickness of the structured surface film, etc. Typically, the polymer particles are chosen from the same polymers described above. The structured cast film was cut into sheets with an aspect ratio of 10:7 (along the grooves:perpendicular to grooves), preheated to about 100° C. as measured in the plenums and stretched to a nominal stretch ratio of 6.4 and immediately relaxed to a stretch ratio of 6.3 in a nearly truly uniaxial manner along the continuous length direction of the prisms using a batch tenter process. That is individual sheets were fed to a conventional continuous operation film tenter. The relaxation from 6.4 to 6.3 is accomplished at the stretch temperature to control shrinkage in the final film. The structured surfaces maintained a prismatic shape with reasonably straight cross-sectional edges (reasonably flat facets) and approximately similar shape. The basal width after stretch (BW′) was measured by microscopy cross-sectioning to be 16.5 microns and the peak height after stretch (P′) was measured to be 5.0 microns. The final thickness of the film (T′), including the structured height, was measured to be 180 microns. The indices of refraction were measured on the backside of the stretched film using a Metricon Prism Coupler as available from Metricon, Piscataway, N.J., at a wavelength of 632.8 nm. The indices along the first in-plane (along the prisms), second in-plane (across the prisms) and in the thickness direction were measured to be 1.672, 1.549 and 1.547 respectively. The relative birefringence in the cross-sectional plane of this stretched material was thus 0.016. The cast and wound polymer film closely replicated the tool structure. Using contact profilometry, (e.g. a KLA-Tencor P-10 with a 60° 2 micron radius stylus).a clear, reasonably sharp prismatic structure was identified on the surface of the film. The measured profile exhibited the expected, nearly right triangular form with straight edges and a slightly rounded apex. The replicated prisms on the polymeric film surface were measured to have a basal width (BW) of 50 microns and a height (P) of 23.4 microns. The peak-to-peak spacing (PS) was approximately the same as the basal width (BW). The profilometry is limited to about a micron in resolution due to the shape and size of the stylus probe and the actual apex may be considerably higher. The tool is also imperfect and small deviations from nominal sizing can exist. A ratio of the profile-measured cross-sectional area to the ideal calculated cross-sectional area provided a calculated fill of 99%. The die orifice through which the molten polymer exits the melt train was brought into close proximity with the rotating belt tool forming a final slot between the tool and die. The pressure at the final monitored position along the melt train increased as the die and tool became closer. The difference between this final pressure and the previously recorded pressure is referred to as the slot pressure drop. The slot pressure drop in this example was 5.5×106 Pa (800 psi) providing sufficient pressure to drive the molten polymer into the structured cavities formed by the tool negative. The film thereby formed and structured, was conveyed by the tool rotation from the slot, quenched with additional air cooling, stripped from the tool and wound into a roll. Including the height of the structures, the total thickness of the cast film (T) was about 600 microns. The cast and wound polymer film closely replicated the tool structure. Using contact profilometry, (e.g. a KLA-Tencor P-10 with a 60° 2 micron radius stylus).a clear, reasonably sharp prismatic structure was identified on the surface of the film. The measured profile exhibited the expected, nearly right triangular form with straight edges and a slightly rounded apex. The replicated prisms on the polymeric film surface were measured to have a basal width (BW) of microns and a height (P) of 23.5 microns. The peak-to-peak spacing (PS) was approximately the same as the basal width (BW). The profilometry is limited to about a micron in resolution due to the shape and size of the stylus probe and the actual apex may be considerably higher. The tool is also imperfect and small deviations from nominal sizing can exist. To better characterize the actual extent of fill, e.g. characterize the precision of replication with the tool, the profilometry cross-section was fit to a triangle. Using data from the measured profile, the edges were fit as straight lines along the legs of the cross-section between 5 and 15 micron height as measured from the base. An ideal apex height of 24.6 microns with an included apex angle of 91.1° was calculated. A ratio of the profile-measured cross-sectional area to the ideal calculated cross-sectional area provided a calculated fill of 98.0%. 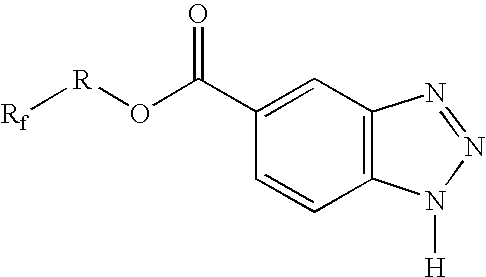 A co-polymer (so-called 40/60 coPEN) comprising 40 mol % polyethylene terephthalate (PET) and 60 mol% polyethylene naphthalate character, as determined by the carboxylate (terephthalate and naphthalate) moiety (sub-unit) ratios, was made in a reactor vessel. The inherent viscosity (I.V.) was about 0.5. The tool was a structured belt having the desired negative version of the structured surface formed on the cast film. The structured surface comprised a repeating and continuous series of isosceles right triangular prisms, with basal widths (BW) of 50 microns and height (P) of nearly 25 microns. The basal vertices of the individual prisms were shared by their adjoining, neighboring structures. The prisms were aligned along the casting (MD) direction. The multilayer optical film was cut into a sheet and dried in an oven at 60° C. for a minimum of 2 hours. The platens were heated to 115° C. The film was stacked in a construction of layers in the order: cardboard sheet, chrome plated brass plates (approx 3 mm thick), release liner, nickel microstructured tool, multilayer optical film, release liner, chrome plated brass plate (approx 3mm thick), and cardboard sheet. The construction was placed between the platens and closed. A pressure of 1.38×105 Pa (20 psi) was maintained for 60 seconds. An oriented, microreplicated structure was constructed as follows: 90° prismatic grooves at 125 micron pitch were embossed into an 0.010 inch thick film of cast PEN(polyether naphalate) by compression molding at 125 C. for 4 minutes. The tool structured film was quenched in an icewater. After removal and drying of the film, the film was then uniaxially stretched 5× along the long axis of the grooves at 128 C. This resulted in transverse shrinkage of 5%, yielding a final pitch of approximately 62 microns. The refractive index was measured to be 1.84 along the oriented axis and 1.53 in the transverse direction. The indices of refraction were measured on the flat backside of the film using a Metricon Prism Coupler at a wavelength of 632.8 nm. wherein the uniaxially oriented polymeric film has (i) a first index of refraction (n1) along the first in-plane axis, (ii) a second index of refraction (n2) along the second in-plane axis, and (iii) a third index of refraction (n3) along the third axis, wherein n1≠n2 and n1≠n3 and n2 and n3 are substantially equal to one another relative to their differences with n1; and wherein the uniaxially oriented polymeric film has a relative birefringence of 0.3 or less and wherein the ratio of the thickness of the body to the height of the geometric feature is at least 2. 2. The polymeric film of claim 1 wherein the film comprises a multilayer film having a plurality of layers of different polymeric composition. 3. The polymeric film of claim 1 wherein the polymeric film has a total thickness and the geometric feature has a base width and wherein the thickness of the body of the polymeric film to the base width of the feature is greater than about 3. 4. The polymeric film of claim 1 wherein the geometric feature comprises a micro-feature. 5. The polymeric film of claim 1 having a retained shape parameter of at least 0.1. 6. A roll of the film of claim 1 comprising a plurality of plies of the film wound upon themselves such that the first surface a specific ply of the film contacts the second surface of a next ply of the film.